As fate would have it, paths crossed with this beauty a few years ago and instantly a friendship was formed. She had me at that perfect eyeliner flick that we all try to master, and master she did. Her style is the perfect combo of classic meets trend, and her personality is equally as alluring. Let’s be honest, we’re all feeling the effects of the bitter winter at the moment and longing for some warmer months, but it’s our skin that really suffers at this time of year. Constantly switching between extreme temperatures can cause our skin to get really dry (as well as very pale!) 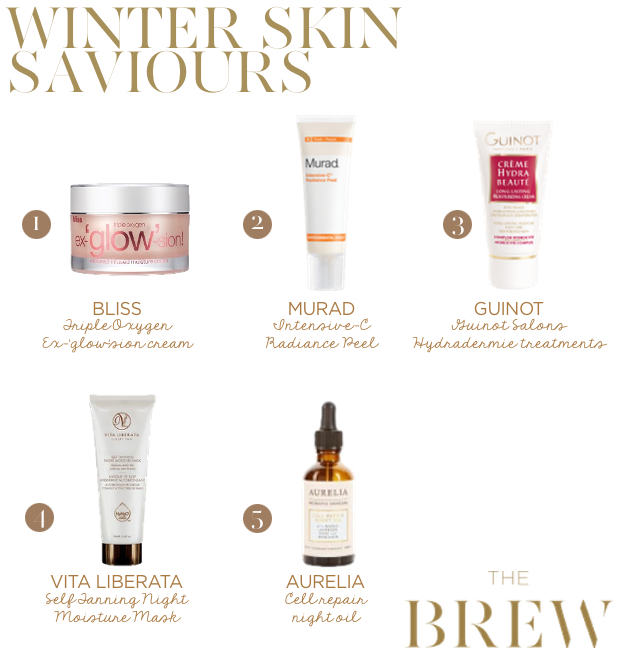 so it’s important to try to make some time, even just 10 minutes, in our daily routine for a skin saviour moment. And starting early will have your skin glowing come spring. One: Moisturise, moisturise, moisturise. It goes without saying right? But commit to moisturising both day and night and your skin will reap the benefits of all those hard-working nutrients and end up looking much healthier. If you’re a real beauty buff then make sure you switch your moisturiser to a thicker, more intense, creamy formula which will really hydrate your skin and protect it from the season’s harsh climate. Make sure you remember to moisturise right down to your chest as well – the décolletage area isn’t immune from the aging process! We’ve been using the Triple Oxygen Ex-‘glow’sion cream from Bliss recently which includes tiny beads of Vitamin E which burst when applied to boost your skins collagen and in turn prevent dryness. Two: The Mask. Make time for using a face mask every so often, in an ideal world we recommend you make it a weekly occurrence. We think it’s a bit of a myth that women don’t have time for them; granted they need to be left on for a while, but why not apply just before you start watching your favourite TV programme and remove in the ad breaks or apply while you’re in the shower washing your hair? They give your skin a rich boost of hydration and revitalise dry and tired looking skin in an instant. Try Murad’s Intensive-C Radiance Peel for brighter and more youthful looking skin. The perfect pick me up your skin needs in time for that party or special date you have planned. Three: Fabulous Facials. Hardly the most frugal of tips, we agree, but who doesn’t love a facial? Let the professionals work their magic on your skin for truly gorgeous effects. If you’ve got a big event coming up, say a wedding or highly anticipated holiday, they are the best investment. Try to schedule in regular facials, one per month if you can, and after each session your skin will end up looking better and better. There are hundreds of different facials out there so make sure you get some professional advice at your local salon about which facial will work best for your skin’s needs. We recommend visiting the experts at Guinot’s salons, I’ve just booked in for a course of Hydradermie treatments at their flagship in Mayfair for the run up to my wedding. I will, of course, dutifully report back! Four: Get That Glow. A healthy looking tan can do wonders to how we look let alone our confidence. There certainly isn’t much sun in the UK at the moment so a little cheating is quite acceptable! There are some great self tans out there and gone are the days of the telltale self-tan smell or a streaky orange finish. An overnight tan is the easiest to introduce into your routine, simply apply before bed and wake up with a gorgeous golden glow. We love the new Self Tanning Night Moisture Mask from Vita Liberata (all their self tans are well worth a try) or try tanner to the star James Read’s Sleep Mask Tan. Five: Beauty Boosters. Give your skin the gold star treatment with the addition of an oil or serum into your daily routine. They have exploded onto the market and it’s no wonder when they really do achieve what they say on the bottle. Rich oils will intensely nourish dull and dehydrated skin even further than your normal moisturiser. Don’t be put off by their slightly higher price tag, a couple of small drops is all you need as they go an incredibly long way and will last for ages. We love the silky smooth nature to them, instantly drenching your skin with goodness. As our must have oil try the Cell Repair Night Oil from Aurelia, the best smelling brand out there and made from 100% pure botanicals.